When I was a child, I was constantly in trouble for being a bookworm. I remember being teased for reading while brushing my teeth. At school, I discovered how to keep an open book under my lift-top desk and read during math class. I once bought a Nancy Drew book just before going to my best friend’s birthday party – and read the whole thing in an hour, lying on my stomach on my bedroom rug, trying hard not to crack the spine so she wouldn’t notice. I was never without a book. There were four of us kids – we were all one year apart in age – and our house could get pretty chaotic at times. Books were my refuge, and I learned how to read any time, in any place, no matter how noisy. I am often asked what my favorite books were when I was in school, and the answer is that I read everything my mother brought home from the library for me, and that I went to the local library so regularly, that I actually counted how many steps it was from my door to its door. I read Nancy Drew and the Hardy Boys, James Bond and Laura Ingalls Wilder. But I was often disappointed with American books. They lacked the one thing I craved most: magic. In those days, just like today, you had to go to England to find magic in children’s books. So I discovered the books of E. Nesbit (The Five Children and It, The Phoenix and the Carpet) and devoured them over and over. Also, my mother was a wise woman. She must have realized that the only way to keep peace at the dinner table was to read to us. So she did, all the great books: Hurry Home, Candy, The Wheel on the School, and best of all The Peterkin Papers. When I wasn’t messing about on the beach by our house in Beverly, Massachusetts, my favorite place to be was a little cabin at the end of a long dirt road on a pond in the woods of New Hampshire. Here we spent every weekend and most of our summers. 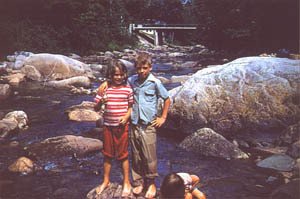 There were no neighbors, no other kids, no tv or telephone, in fact, no real running water. We found our entertainment in the woods, and on the pond: fishing, swimming, canoeing, sailing, skating. We still own that little cabin, and it is still an important place for me. It’s where I wrote my first children’s book, Little Beaver and the Echo. It’s where I go to write most of my books. Although I made up my mind in fifth grade that I wanted to be a writer, I never really studied writing. In college I took only one writing course. When I graduated I decided to learn to write by actually writing. I began by working on my local newspaper, the Harvard Post, and later by freelancing for magazines. By then I was married and had a step-daughter, Emily. Emily became the star of my first book, A Very Young Housewife, when she was nine. We had a great deal of fun making that book, but afterwards I decided to concentrate on journalism, which I did for the next ten years. We moved to France for a year, and then to England for four years, where my son Alex was born. One day, when Alex was 18 months old, we made a trip back to America to visit the cabin in New Hampshire where I had spent my childhood. It was that day, in that place, that I wrote my first children’s book, Little Beaver and the Echo. It went on to become a best seller, and I realized I had discovered the kind of writing that I was meant to do.